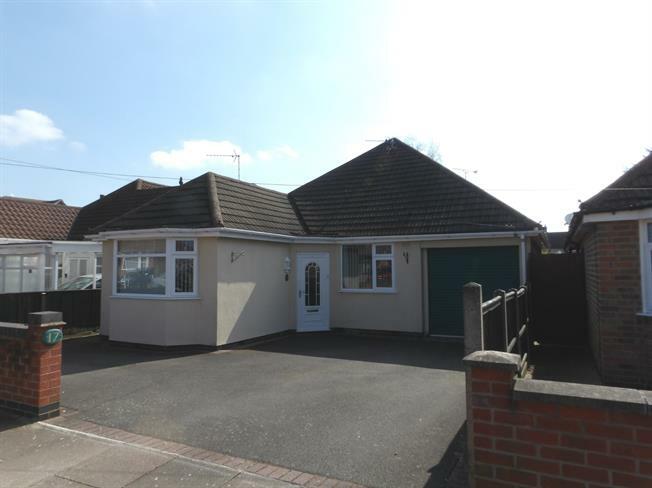 2 Bedroom Detached Bungalow For Sale in Leicester for Asking Price £245,000. A perfect opportunity to acquire this spacious, very well presented two bedroom detached bungalow situated in the ever popular Thurmaston and being ideally located for an excellent array of amenities including local shops, schools and supermarkets. Also having good transport links and bus routes. Offered to the market with no upward chain this property comprises, large lounge/diner over looking the rear elevation with a bay window and a featured electric fire. Fitted kitchen with integrated dishwasher, cooker/hob and space for other appliances, roll top work surfaces and splash back tiles, two double bedrooms and a family bathroom fitted with a low level W/C, wash basin, bath, separate shower and storage cupboard. Externally, off road parking for two cars, a single garage and a beautiful private rear garden with a patio area and a well maintained lawned area. An airy hallway giving access to all accommodation with laminate flooring. Over looking the garden, uPVC windows, carpet flooring and a featured electric fire. Over looking the rear elevation giving access to the back garden. Fitted with roll top work surfaces, splash back tiles, stainless steal sink. Integrated dishwasher and space for other appliances. Over looking the front elevation, uPVC bay fronted window and carpet flooring. Over looking the front elevation, uPVC window and laminate flooring. Fitted with low level W/C, wash basin, bath and separate shower, radiator and uPVC window.